When people think about interior design, the most common image that will come to mind is a room inside a home. The word “stylish” can make you think of cute clothes or a home straight out of Pinterest, so making every room have a distinct style where you live is what most homeowners dream about. It’s all fun and games until you finally get down to facing your garage. The garage is much like an attic or a basement. It’s where things eventually end up and find a home, even when you don’t actually want them to be there. Messy extension cords and empty plant pots litter the corners, and sometimes the mess can even prevent you from parking your car inside. Don’t let yourself get discouraged! 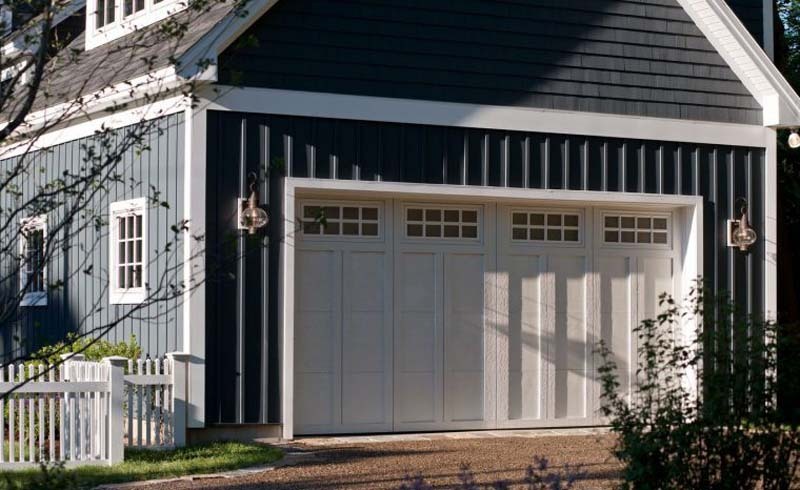 Read on for a few easy ways you can create a simple and stylish garage in a breeze. This is always a challenge—actually keeping your garage clean. This doesn’t mean that you have to do a full inventory every week, but it does mean that you need to pay attention to details. Loose, dead leaves and corners full of cobwebs will make anyone want to turn and run out of the room. Instead, sweep out dirt and debris. Keep cobwebs away by cleaning at least once a month, and make sure no bugs are making homes in any hidden nooks. Going through your things may actually benefit you more than anything else. At least once a year, do a full clean out of your garage so you know what you have. Do you really need that collection of gardening gloves that sits on your workbench? Throw out what you haven’t used in the past year so your garage can get a real makeover. To keep your garage looking stylish, organization is a must. If organizing isn’t exactly your strong point, no need to fear! 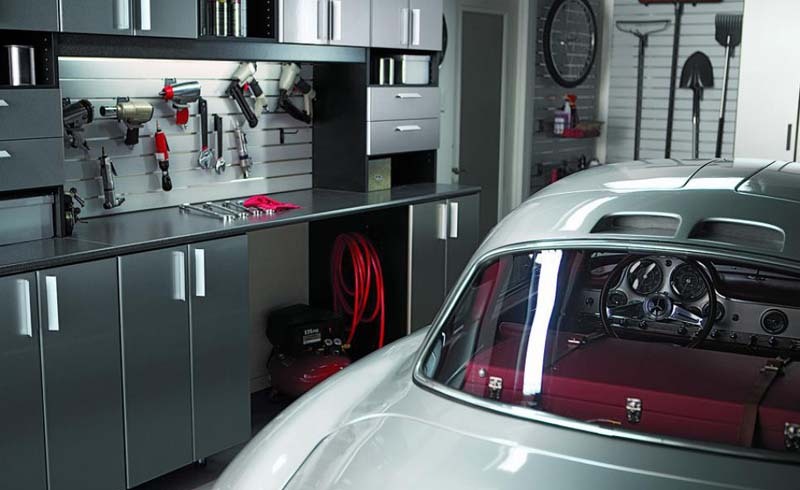 There are so many helpful ways to organize your garage space! To start, you will have to think about what you need to put away and how much space you must use. Once you figure that out, you can use ceiling and wall storage options to maximize your space before buying things like an additional work bench or shelving. Maybe the interior of your garage isn’t what needs styling. Plenty of people decorate their garage door to add some personalization to their home! You can get inspired with an online look book to see what other people are doing and make sure you’re not missing out on a great design. A monogram or other simple accessory could be all you need to transform your garage. A fresh coat of paint always does wonders for a room, so it can do the same for your garage. Touch up any trim you have around your windows and interior garage door with white paint and to give it new life, and consider painting the walls as well. A light gray or pastel spring color will work well with any sunlight it might get exposed to and they’ll age well. Buy yourself a can of paint and try it out on a wall. Adding a splash of color in your garage might be exactly what you need. Thinking about cleaning out your garage may be intimidating if you know you have a lot of junk in there, but it can get even more daunting when you try to imagine making it stylish. It’s a room that seems to have never ending junk on every shelf, and there are bugs to be found under any equipment or tool. It’s gross and easy to put off for later, but when will later actually arrive? Don’t procrastinate taking care of your garage any longer. It needs attention and love just like any other room in your house and yes, it can be styled. The first step to refreshing any room is to clean it top to bottom so you know what you’re dealing with. Then get creative with paint and accessories to give your garage a bit of personality. When you’re done, you’ll love how it looks and you can use that as motivation to keep it looking nice all year long.